From left: Hospital Corpsman (HM3) Dumbuos Asigri, dentist Dennis Miller and Hospital Corpsman (HM3) Anthony Bolton provided Jack Wells, of Darwin, dental services. Brogan visited the veterinary mission with his puppy Sadie. PFC Justin Hardie helped fabricate glasses. The Mission provided 681 free pairs of glasses. MEIGS COUNTY —The Ohio River Medical Mission served almost 3,000 people and animals during its 10-day run earlier this month. The Ohio River Medical Mission took place June 2-11. The patients came from 61 towns across 20 counties in four states. Services included 844 dental services; 703 vision services with 681 free pairs of glasses; 646 behavioral health services including a post-traumatic stress syndrome workshop; 1,128 ministry services and 343 prescription services. Nutrition counseling services were also available, as well as a program on eating healthy on a budget. 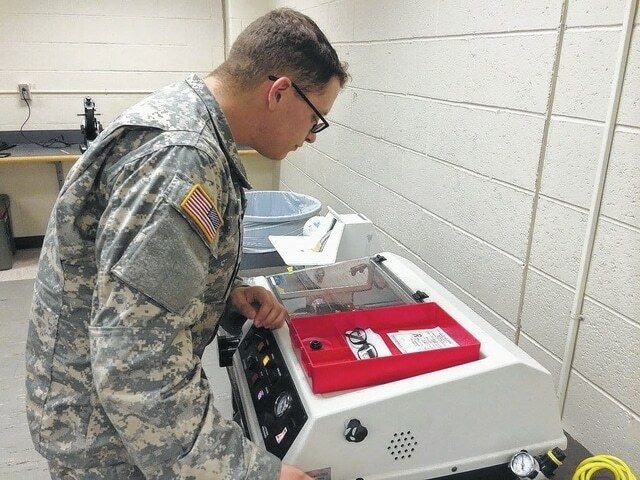 “We were committed to giving the people in the state of Ohio the highest quality care possible,” Mission Commander Lt. Col. Brian Poynor, of the 7241st Medical Support Unit, Army Reserve Medical Command, said. Many of the services provided were routine care, including teeth cleanings and vision exams, with some significant medical findings occurring as well. Among the stories recalled by Mindy Cayton, AAA8 planner of the event, was a woman who had not had her teeth cleaned in more than 10 years and the gratitude she expressed to those involved in the mission. In addition, two patients were found to have potentially serious vision problems, including high eye pressure and a detached retina, and were referred for treatment. A medical patient was also taken to Ohio State University Hospital for treatment of a brain bleed that was found during the mission. Another patient awaiting a heart transplant who needed necessary dental procedures but could not afford them was able to complete the dental services to make way for his heart surgery. The veterinary portion of the Mission helped care for 986 animals (907 exams, 41 neuters, 36 spays and 1 surgery that will result in prevented/unwanted litters of 206,000 dogs and 38.7 million cats). Through a coordinated effort, 390 volunteers served more than 33,000 hours (a value of nearly $77,500 to the community). A variety of distinguished guests visited the regional event including Ohio Sen. Lou Gentile (30th District); Ohio Rep. Debbie Phillips (94th District); Jason Wilson, director of the Governor’s Office of Appalachia; Jeanne Wilson for U.S. Sen. Sherrod Brown; Todd Shelton for U.S. Sen. Rob Portman and Ashley Karlen for U.S. Congressman Bill Johnson; Athens Mayor Paul Wiehl; Athens County Commissioner Lenny Eliason; Middleport Mayor Mike Gerlach; Gallia County Commissioner David Smith; Col. Glenna Donovan of the Army Medical Command, and Col. Mandy Birch of the Office of the Secretary of Defense. The Mission would not have been possible without all the key community partners and supporters including: Area Agency on Aging 7 & 8; The Bartees; Big Buck radio; Buckeye Hills-HVRDD; Civitas Media; The Corp. for Ohio Appalachian Development (COAD); CPC, Ink; Farmer’s Bank; Gallia-Meigs Community Action; Hocking-Athens-Perry Community Action; Holzer Health System; Meigs Co. Agricultural Society; Meigs Chamber of Commerce; Meigs Co. Commissioners; Meigs Co. Council on Aging; Meigs Economic Development Office; Meigs Co. EMA & EMS; Meigs Co. Health Dept. ; Meigs Co. Job & Family Services and Jobs Ohio; Meigs Local School District; Meigs Co. Sheriff’s Office; Meigs & Mason American Legion and VFW Posts and Auxiliaries; New Era Broadband; Ohio Dept. of Transportation; Ohio Benefit Bank; Ohio Univ. Heritage College of Osteopathic Medicine; Pepsi/Aquafina; Prevent Blindness Ohio; RSVP; the State of Ohio; Sunny 93 Radio; Trifecta Productions; WJOS TV; WYVK Radio. Grant funding for the community needs portion of the event was provided by the Ohio Governor’s Office of Appalachia and the Sisters Health Foundation. The Medical Innovative Readiness Training partnered with the 7241st Medical Support Unit, Army Reserve Medical Command from Lexington, Ky., with sister services from the U.S. Navy and 24th Medical Detachment from Ft. Bragg, N.C. Innovative Readiness Training provides real-world training opportunities for our nation’s military service members and units to prepare them for their wartime missions while supporting the needs of America’s under-served communities. “This little thing that started with two people and a piece of paper has affected thousands of people not just in Meigs County, but in the whole tri-state area,” Meigs County Commissioner Mike Bartrum said.